I like a little spice in my meals – enough to wake up my taste buds but not so much that I start sweating. These Spicy Black Bean & Corn Quesadillas have the perfect blend of spices for me but you could spice it up a bit more with using a hot Taco seasoning mix and spicy guacamole. I don’t include quantities here because you can fill these as much or as little as you’d like. I always fill my quesadillas a lot so they are overflowing but others may not like to be as messy! A pizza cutter is the easiest way to cut a quesadilla into pieces while not losing your fillings. Fill your quesadillas as much or as little as you'd like! In a medium bowl, mix the corn, black beans and chicken with a tablespoon of the dry taco seasoning mix. Stir until evenly coated. Put one tortilla in the quesadilla maker (or frying pan) and top with your fillings. Add cheese then top with the second tortilla and cook evenly on both sides (just until slightly crispy). For more delicious recipe ideas, visit our Recipe page. We’re always adding new & tasty ideas. Never miss an update by following us on Facebook, Twitter, Pinterest, Google + and Bloglovin’. Yum! We love quesadillas, but we haven’t thought to do black bean and corn in them. What a great combo! 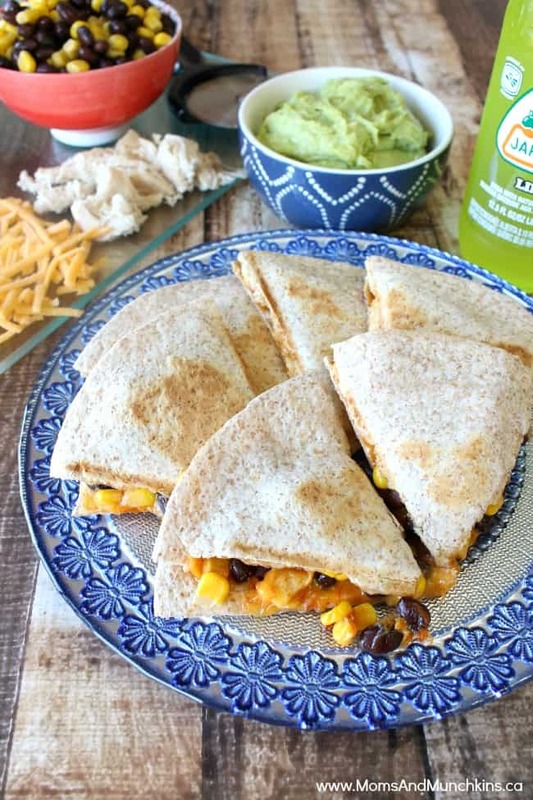 My kids will go crazy for these quesadillas! Thanks for linking up with What’s Cookin’ Wednesday!